NASA's LDEF (Long Duration Exposure Facility) was designed to provide long-term data on the space environment and its effects on space systems and operations. It successfully carried science and technology experiments that have revealed a broad and detailed collection of space environmental data. The LDEF concept evolved from a spacecraft proposed by NASA Langley Research Center (LaRC) in 1970 to study the meteoroid environment, the Meteoroid and Exposure Module (MEM). LDEF had a nearly cylindrical structure, and its 57 experiments were mounted in 86 trays about its periphery and on the two ends. The spacecraft measured 30 feet by 14 feet and weighed ~21,500 pounds with mounted experiments, and remains one of the largest Shuttle-deployed payloads. The experiments involved the participation of more than 200 principal investigators from 33 private companies, 21 universities, seven NASA centers, nine Department of Defense laboratories and eight foreign countries. The post-flight special investigations and continued principal investigator research have increased the total number of investigators to between 300 - 400. LDEF was deployed in orbit on 7 April 1984 by the Shuttle Challenger. The nearly circular orbit was at an altitude of 275 nautical miles and an inclination of 28.4 degrees. 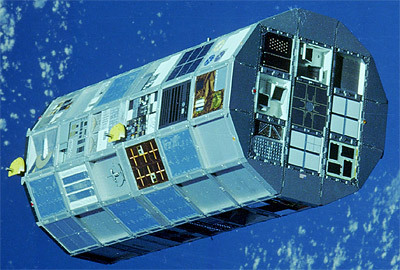 Attitude control of the LDEF spacecraft was achieved with gravity gradient and inertial distribution to maintain three-axis stability in orbit. Therefore, propulsion or other attitude control systems were not required, and LDEF was free of acceleration forces and contaminants from jet firings. LDEF remained in space for ~5.7 years and completed 32,422 Earth orbits; this extended stay increased its scientific and technological value toward the understanding of the space environment and its effects. It experienced one-half of a solar cycle, as it was deployed during a solar minimum and retrieved at a solar maximum. LDEF was retrieved on 11 January 1990 by the Shuttle Columbia. By the time LDEF was retrieved, its orbit had decayed to ~175 nautical miles and was a little more than one month away from reentering the Earth's atmosphere. Columbia landed at Edwards Air Force Base and was ferried back to NASA Kennedy Space Center (KSC) on 26 January 1990. Following the deintegration of each experiment tray from the spacecraft at KSC, research activities included a radiation survey, infrared video survey, meteoroid & debris survey, contamination inspection, and extensive photo documentation. After these post-deintegration activities the experiment trays were shipped or hand-carried directly from KSC to the principal investigators' laboratories.